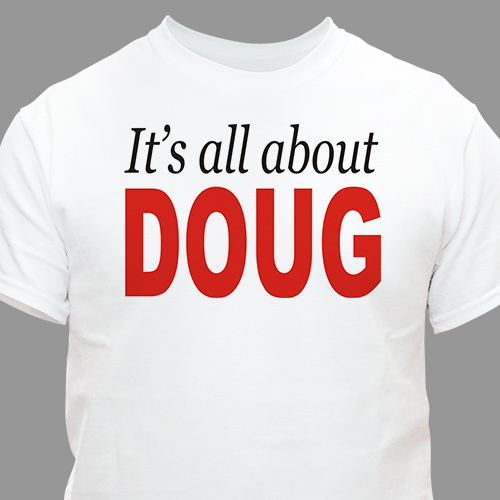 Our Personalized T-Shirts let everyone know exactly how you feel. It's All About Me. Wear this custom printed t-shirt with pride and conviction because you are worth it. Our It's All About Me T-Shirt is available on our premium white 100% cotton Personalized Shirt, machine washable in adult sizes S-3XL. Also available on Ash Gray. Includes FREE Personalization! Custom Print your It's all about Me T-Shirt with any first name. This is great... was looking for something funny for one of my older relatives. GiftsForYouNow.com has a collection of Custom Printed T-Shirts. Our Custom Printed T-shirts are perfect for Christmas, Mother's Day, Father's Day, Sweetest Day, Valentines Day & Birthdays. Create a custom printed T-shirt for someone in your family today. Mom, Dad, Sister, Brother, Grandma or Grandpa will love this wonderful custom printed t-shirt which you have personalized just for them.